Stanford's Tourist's Map of the Isle of Wight with popular references to Fossili Ferous Localities, Antiquities, Landing Places for Boats, &c. and an Appendix showing the Island, Southampton Water, and the Adjacent Country. 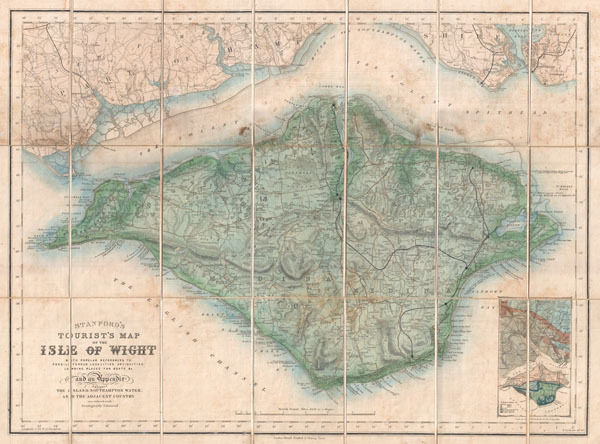 An uncommon 1879 pocket map of the Isle of Wight prepared by Edward Stanford. Covers the entire island as well as adjacent parts of Hampshire across the Solent Spithead. Wight is known for its unusual geology and ancient fossil's. This map attempts to locate likely locations for fossil hunting as well the sites of various antiquities and island communities. A geological overview of the region appears in an inset in the lower right quadrant. Very good. Attached to original linen though the adhesions is very weak and has come loose in some places. Light soiling. Comes with original linen binder. Else very nice.